The necromancer is an archetype whose power players crave, but whose darkness many gamemasters will look askance at. This is particularly true for gamemasters who want groups of heroes, not simply characters who are a lighter shade of gray than the servants of darkness they’re standing against. Those who deal with the dead are often seen as unclean, secretive, or malicious… but what if they used their powers in service of a greater good? Like in service to a god of death and fate, for whom the undead are a scourge to be destroyed wherever they’re found? Someone like Midgard’s Charun, for example? Before we delve too deep into the story with this one, it’s important to choose what form of necromancer you’re going to become. 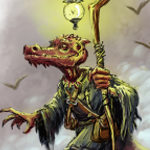 For example, are you going to go the traditional route with the specialist wizard, gaining command or turn undead? Will you, instead, go the sorcerer route and play a character who is afflicted by the undead bloodline? While there are other ways to focus on necromancy, these are the two biggest archetypes. Once you’ve decided on your method of achieving the title of necromancer, you need to decide in what ways you’re going to use your powers to fight against the undead. For example, will you use the undead bloodline’s arcana to debuff undead using spells they’re typically immune to? Spells like daze, charm person, or touch of idiocy are all fair game, and they can throw a huge monkey wrench into undead foes’ plans. The same strategy could be adopted by wizards who use the Thanatoptic Spell or Threnodic Spell metamagic feats (Ultimate Magic, p. 157) to overcome an undead foe’s immunity to certain magics. An alternative strategy is to use the feat Skeleton Summoner (Ultimate Magic, p. 155). This feat modifies your summoned monsters, allowing you to summon skeletons, skeletal champions, and once per day to summon any creature off the list with the skeleton template added onto it for some additional oomph. The benefit of this approach is that, rather than desecrating the dead by raising corpses as zombies, you’re calling out to those from another plane. When their duties are done, they go back where they came from. You send a thief to catch a thief, and if you need someone to battle the threat of the undead there is no one more savvy or knowledgeable than a necromancer. With a potent array of spells at his or her command, a necromancer who fights against the undead would be able to untie the knots binding them to the material plane, sending them on to where they’re meant to be. Whether they’re priests of a holy order, or simply worshipers who are using their gifts to do the will of a god of death, dealers in death magic are not foes to be taken lightly. Specialist wizards who choose the Command Undead feat can tear the strings of command away from the puppet masters, forcing the dead to stand aside. Even powerful undead creatures may be forced to bow to the will and authority of the necromancer. Those who have proven their service to a god or goddess of death and fate may even be given the authority to call on the dead for reinforcements. Skeletal beasts may stand before these arcane masters, defending them and their causes. Skeletal warriors fallen in battles both recent and ancient may answer the call from far-off realms, bringing their swords and shields to bear. Even mighty champions of ages past may draw steel on behalf of these necromancers, perhaps hoping to earn mercy when their sins are tallied. 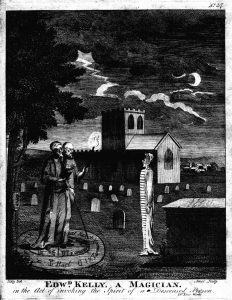 Who your necromancer is, and why he or she serves the Lord or Lady of the afterlife is up to you. Was he a stillbirth who took a breath as soon as his mother died, granting him a simultaneous familiarity with the graveyard and the birthing room? Is she a dhampir whose heritage has given her terrible magics in addition to an unholy thirst? Was this necromancer a servant made to work in the catacombs? Perhaps the latest in a long line of arcane warriors from, trained to fight the undead hordes of an enemy nation? There are a lot of possibilities, just remember, not all necromancers wear black. For more unusual character concepts and tabletop tips, check out Neal F. Litherland’s blog Improved Initiative! You might also be interested in the White Necromancer.